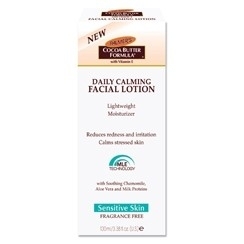 This light, fast-absorbing lotion is specifically designed for sensitive, redness prone or irritated skin. A special blend of natural ingredients such as Chamomile and Aloe Vera helps reduce the appearance of redness, calm and soothe sensitive skin, and leaves it hydrated without a greasy feel. Contains a special emulsion of plant derived ingredients which mimic the structure of the skin's own natural moisture. Helps in the restoration of the skins' protective barrier, which prevents further drying due to environmental factors. With continued use, skin feels fresh, smooth and healthy. Fragrance Free. Suitable for Sensitive Skin. Affordable. Absorbs easily. Very soothing, and leaves the skin feeling soft and 'plumped up'. Suitable for sensitive skin. Soothing and calming, but doesn't significantly reduce redness. The scent is a little bit cloying. An excellent daily moisturizer that's suitable for sensitive skin. I love this lotion it has a great consistancy and soaks into skin really easily.afterwards my skin ft so nourisbed and plumped. It has a lovely fresh subtle scent.